I’ve been playing around a lot with Silverlight 2 recently, I’m find it a lot easier to code than version 1. In many of the schools I have been to, they have had a proxy server for all their internet traffic. I created a bat script that wrote to the registry and asked the user to either type 1 to turn the proxy on or 0 for off. It worked great but wasn’t easy on the eye and one network I went to it stopped the users from using command lines. So I thought it was time to create something that was more graphical. It would also solve the issue of a user typing 2 on the above script and causing errors in the registry. Download the Microsoft Expression Blend 2.5 March Preview (available at time of writing this post). We’ve done everything we need to now in Expression Blend so we need to move the project over to Visual Studio. Make sure you save your project. 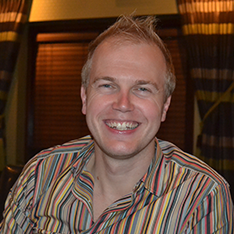 Over on the write hand side you will see Solution ‘ProxyEnableDisable’. 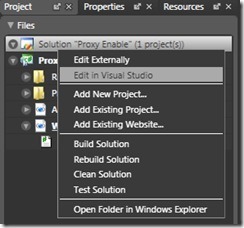 Right click here and click on Edit in Visual Studio. This should have now opened up Visual Studio. You will see the same layout above, down the right hand side. Double click on Windows1.xaml. 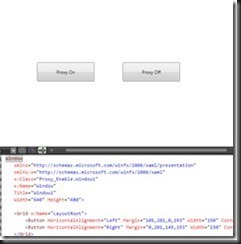 This is the silverlight coding. 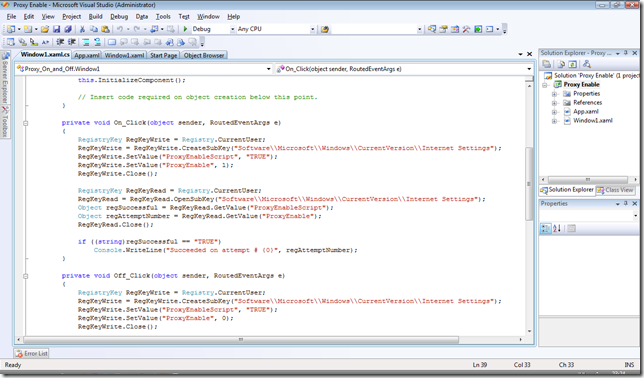 If your using Visual Studio 2008 you will see the xaml code and a graphical view of our project. We need to start adding come code to the buttons. We’ll give it a x:name and then add a click handler for both of the buttons. 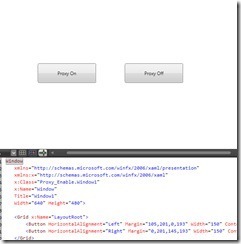 Find the line of code for the button with the content that is equal to Proxy On and add x:name="On". Also type click and click on <NewEventHandler>. This will allow us to add come C# handling code to this button. tton the user clicks on. The below code will turn the proxy server on. The 4th line down is where you are telling the registry to either have the proxy server enable or disabled. The value of 1 will turn the proxy on where 0 will disable it. Add the line of code to both of your button event handlers remembering to change that 1 to 0 for proxy off. Now its all yours to be customised. Don’t forget to install Silverlight 2 on your clients before rolling it out.